The Story & Clark piano with its warm, reddish brown finish looked nice in the living room and probably improved the appearance of our home. The problem was that none of us played the piano. So my parents decided that their middle child—me—should take lessons. My older brother already had plenty of activities. My younger sister was not considered. At nine, and without a lot of extracurricular activities, I was apparently the perfect candidate. Except that I had no interest in studying the piano, or any other instrument. My grandmother, a kind and generous person, declared that I was quite musical, but I had no idea how she arrived at this conclusion. Perhaps it was based on the circular logic that, since my parents had bought a piano and made the decision to send me to Mrs. Bouchard for weekly lessons, ipso facto, I must be musically talented. Mrs. Bouchard was a pleasant, gray-haired lady, and she agreed to teach me, but she could not have listened to me play and concluded that she had a prodigy on her hands. Nevertheless, she was encouraging. 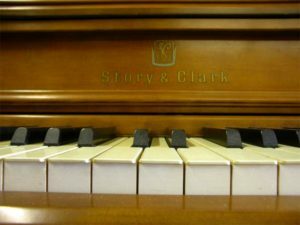 From time to time, my parents heard me complain about taking lessons, and it irritated them because they had gone to the trouble of investing in a piano and, besides, why would I not want to play the piano? Neither of them had had the advantage of lessons when they were children. More than once, I was made aware of the privilege I enjoyed. But still I hated practicing. While I was supposed to be practicing—in true passive aggressive fashion—I took to scratching at the Story & Clark logo, centered in gold letters above middle C. I imagined at first that the umber finish would remain once the gold letters were removed, but, instead, the finish came off as well, exposing the underlying raw wood. It was immediately obvious that it was going to be an ugly mark. This did not stop me from continuing my vandalism. I’m surprised how little my parents rebuked me for this. Story and Clark Piano by Zigler Music. CC license. At first, my parents—usually Mom—drove me to my lessons, but eventually I was allowed, on my honor, to walk to Mrs. Bouchard’s house after school. Then, one day, after at least a year of lessons, I ran away. My father drove around until he found me wandering the neighborhood and picked me up. He said that Mrs. Bouchard had called to let Mom know that I had missed my lesson. He gave me the lecture about how much of a privilege it was to have a piano and lessons. I said that I did not want to take lessons, but I was persuaded by both of my parents to go back for one more lesson. Mrs. Bouchard saw me the next week. She had me play a piece and was encouraging, as usual. I had come a long way in a year, she said, and I could do well if only I would practice more. She said that she did not enjoy teaching someone who did not want to learn. Still, if I ever changed my mind, she would welcome me back. I ended my association with Mrs. Bouchard that day and never returned. I have forgotten much of what I learned from Mrs. Bouchard, but I still seem to be quasi-literate musically. I can read music well enough to laboriously pick out a tune on the piano. (I do not know what it sounds like without playing it—such a feat of true musical literacy is beyond me.) There have been times when I have had a genuine desire to learn to play a popular tune or wished that I could write down a melody that had drifted through my mind. Instead, I could neither write it down nor remember it. I am not so completely indifferent to music as I thought I was at nine and ten. But talented, no. I suppose that if I had worked hard at it, I could have been a mediocre pianist, but I just disliked piano lessons from the start. I hate to admit it, but my parents were not altogether wrong about the advantage of playing an instrument and knowing something about music. It is just that the way they went about it was doomed. Miles Fowler lives in Charlottesville and is currently at work on a time-travel novel. He has been a frequent blogger for Streetlight, and more blogs can be found on his site.